Something's not quite right in the small town of Williston, North Dakota. That much is obvious just from the fact that oil company deal closers Barb (Kate Grimes) and Larry (Robert LuPone) are expected to share quarters in a trailer camp setting (drably designed Graham Kindred, who also designs the lighting). And how is it that their parent company didn't let them know that they were sending a new numbers guy, Tom (Drew Ledbetter) to bring in the lease on one of the largest and possibly most productive tracts of land? After all, the killer team of Barb and Larry has been working for years on "Indian Jim," the Native American holdout who is reluctant to allow drilling on his land. Playwright Adam Seidel crafts a nifty three-hander where everything and everyone is not as it seems. A greedy corporate message takes a back seat in this work to the interaction among characters. We think we might know them. They may even think they know themselves, but when push comes to shove, .what they are willing to do to get ahead, make a buck and grab some power surprises all. Deftly directed by Valentina Fratti, the actors are given the freedom to unwrap layers. Fratti keeps the action moving around the small stage to mimic the ever-changing status of the characters and their relationships to each other. We even experience a meeting where six other people are unseen. Grimes goes deep as the seasoned woman who knows how to hold her own and get ahead in a man's world. There are hints at more than just a business relationship between her and long-time collaborator, Larry. LuPone portrays a tough guy on the outside, but stuns with the revelation of a scared vulnerable man just under the surface. Ledbetter strikes a nice balance between his character's innocent newbie facade and the ruthless power grabber who hides waiting for a chance to strike without mercy. 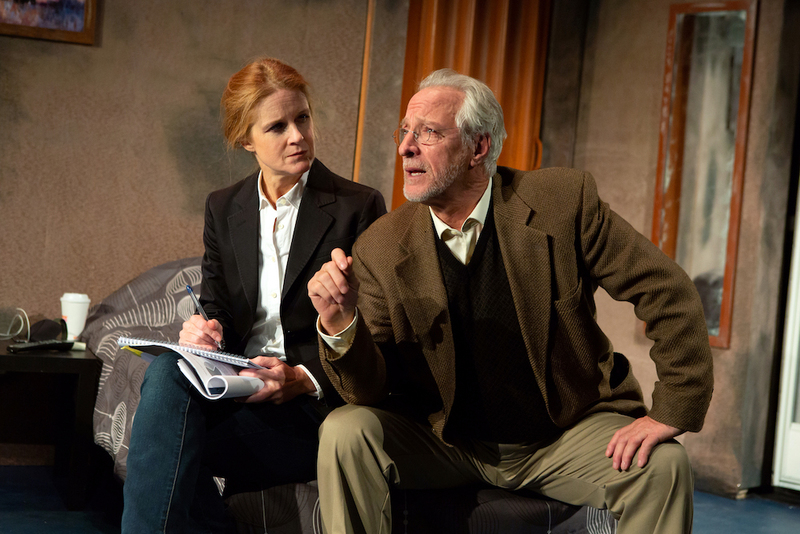 The limited run plays at IATI Theatre, 64 E 4th St., NYC, through Nov. 10 mirandatheatrecompany.com. There is a clever surprise takeaway at the conclusion of the 90-minute production. Additional Credits: costume design by Matsy Stinson, sound design by Margaret Montagna. The Waverly Gallery in Greenwich Village has seen better days, It's not longer a vital part of the art landscape. No one comes in or thinks what it has to offer is important. 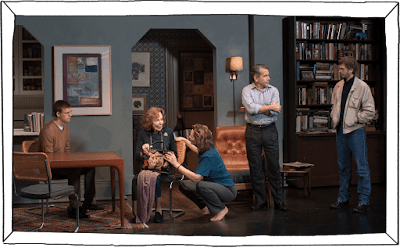 The same can be said for its owner, elderly Gladys Green, played with astonishing alacrity and pathos by Elaine May, who no doubt will be nominated for a Tony. With her mind and hearing fading, Gladys spends her days at the gallery passing time waiting for someone to come in and buy the less than exciting art displayed on its walls. When she's not there, she lives in an apartment behind the shop. As her health deteriorates, the anxiety of her family increases, especially as she repeats family stories ad nauseam and keeps messing with her hearing aid settings so the family has to incessantly yell or adjust them for her. Her grandson, Daniel (Lucas Hedges, who snagged an Oscar nomination for his role in playwright Kenneth Lonergan's film "Manchester by the Sea," making a noteworthy Broadway debut) lives next door and increasingly spends sleepless nights as his grandmother rings his bell to check in or ask for help. Daughter Ellen Fine (a fabulous Joan Allen) knows what needs to happen. 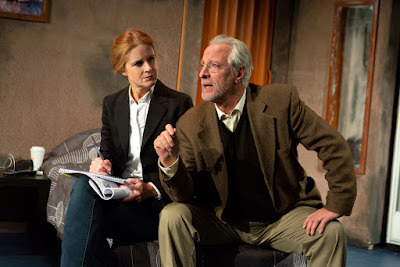 Her mother can't be on her own and must move in with her and her husband, Howard (a jovial David Cromer getting some time on stage instead of off stage where he has distinguished himself as one of Broadway's finest directors). She dreads it, though, and doesn't think she will survive the arrangement. The family gets a little help from Don Bowman (Michael Cera), an awkward guy from Boston who fancies himself a talented artist. Gladys offers him a place to stay and his dream come true: a show in a Greenwich Village gallery. Don helps look after Gladys a bit, but disaster strikes when the building owner decides to turn the gallery into a restaurant and gives Gladys her notice. The story is told through the eyes of Daniel, who steps out of the action (with excellent lighting by Brian MacDevitt) to serve as a narrator from time to time. His rapport with the audience is not severed when he returns to the action and we cannot help but appreciate his subtle humor. David Zinn's set creates a feeling of imposing doom as a second story of brick towers above the gallery location with exterior walls blocking escape. Director Lila Neugebauer expertly guides time passages and our heart breaks as Gladys deteriorates. Allen's performance as the daughter torn between loves, duty and despair is gut-wrenching. May's fear as she realizes what is happening to her -- then when she doesn't understand any more what is happening to her -- is palpable. The 86-year-old gives a bold, extraordinary performance that should not be missed. Lonergan's script is a delight. He packs an amazing amount of character development, engaging dialogue and emotion in to just two hours and 10 minutes. It deserved its Pulitzer Prize nomination in 2000. Ann Roth (Costume Design), Leon Rothenberg (Sound Design), Tal Yarden (Projection Design) and Luc Verschueren and Campbell Young Associates (Hair and Makeup Design). It's 1981 in Northern Ireland and the happy Carney clan has gathered for the harvest, but the local priest (Charles Dale) and an ominous visitor from the IRA (Stuart Graham) threaten their happy celebrations. The family finally discovers what happened to their beloved Seamus, who disappeared more 20 years ago, leaving behind his wife, Caitlyn (Laura Donnelly) and son, Oison (Rob Malone). 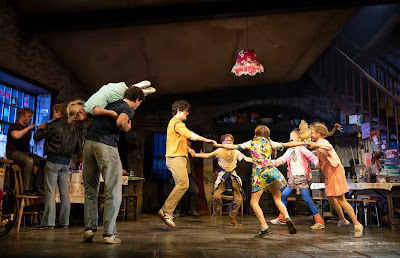 They stayed on with Seamus's brother Quinn (Paddy Considine) and his invalid wife, Mary (Genevieve O'Reilly) and their seven children (one of whom is a baby who charms the entire audience). Filling out the household, in which playwright Jez Butterworth evokes the best of the eclectic family of You Can't Take It with You, are humorous Uncle Pat (an engaging Mark Lambert), not to be confused with Aunt Pat (Dearbhla Molloy) and Aunt Maggie Far Away (Fionnula Flanagan), the elderly aunt who entertains the children with her adventures in other times and places as she fades in and out of dementia while parked just off the action in her wheelchair. A slow-witted Englishman named Tom Kettle (Justin Edwards) and some visiting Corcoran cousins, including Shane (Tom Glynn-Carney), who might have ties with Seamas's disappearance, add to the tension -- and the crowd on stage. Rounding out the ensemble are Dean Ashton, Glynis Bell, Peter Bradbury, Trevor Harrison Braun, Sean Frank Coffey, Will Coombs, Gina Costigan, Fra Fee, Carly Gold, Cooper Gomes, Holly Gould, Carla Langley, Matilda Lawler, Conor MacNeill, Michael McArthur, Willow McCarthy, Colin McPhillamy, Bella May Mordus, Griffin Osborne, Brooklyn Shuck, Glenn Speers, Rafael West Vallés, and Niall Wright. Sam Mendes directs the Royal Court Theatre production with excellence, setting an undercurrent of unrest despite the seemingly happy existence of the family, marked by singing, dancing (choreography by Scarlett Mackmin) and cute animals trained by William Berloni. But inside, dark secrets threaten to cloud the external. The ferryman, after all, is a reference to Caron, the mythologcal transporter of souls across the River Styx. A surprise twist at the end of the three-hour, 15 minute run will have you gasping. 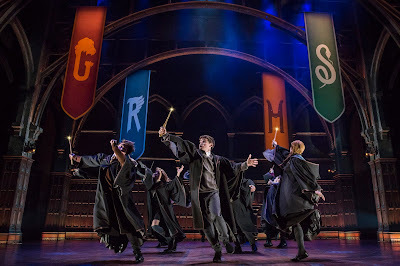 Rob Howell helps create the atmosphere with scenic and costume design, aided by Peter Mumford;s lighting design), Nick Powell's sound design and original music. The Ferryman opened at The Royal Court in May 2017 and was the fastest selling play in the theater’s history. The sold-out show transferred to the Gielgud Theatre in London’s West End. In London, The Ferryman won three 2018 Olivier Awards, including Best New Play (marking Butterworth’s second Olivier win), Best Actress Donnelly and Best Director Mendes (marking his fourth Olivier win). Tim Hoare (associate director), Benjamin Endsley Klein (resident director), Campbell Young Associates (hair, wigs and makeup design), Terry King (UK fight director), Thomas Schall (US fight director), Majella Hurley (UK dialect coach), and Deborah Hecht (US dialect coach). 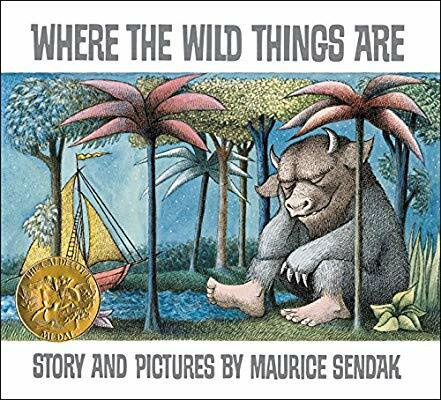 The Maurice Sendak Foundation announced that it has commissioned the first major and only full-length stage play adaptation of Where the Wild Things Are. This stage adaptation follows a 1984 opera and 2009 film based on the classic children’s story. The New Victory Theater (a project of The New 42nd Street),New York City's premier performing arts nonprofit entirely devoted to kids and families, has committed to produce the play, marking its first foray into original production. The creative team for the production is in formation and will be announced at a later date. The Foundation commissioned Sendak’s dear friend and collaborator, Arthur Yorinks, to write the script. The Foundation remains steadfast in preserving Maurice Sendak’s artistic legacy and will remaster and reissue Sendak’s books with publishing partner HarperCollins in the coming years. Earlier this month, HarperCollins published Presto and Zesto in Limboland, a book discovered years after Sendak’s passing, co-authored by Arthur Yorinks. This is the third book collaboration for Yorinks and Sendak, predated by The Miami Giant (1995) and Mommy? (2006). The University of Connecticut will house all Sendak’s book art in the Northeast Children’s Literature Collection by March 2019. Construction on an archive attached to Sendak’s Connecticut home has also been completed and will open to the public, by appointment only, in late 2019. This archive will house the rest of Sendak’s art. Additionally, the Sendak Fellowship & Workshop that has been a part of the Foundation since Sendak was alive will continue in 2019, taking place on the grounds of his home. For more information on The Maurice Sendak Foundation visit www.SendakFoundation.org. For more information on Yorinks visit www.arthuryorinks.com. 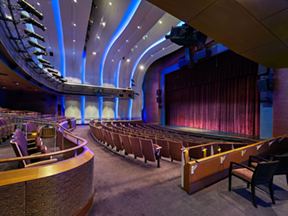 The New Victory Theatre is located at 209 West 42nd St., NYC. Join NYCCT for three original, entertaining and enriching theater productions and along the way you'll help a friend who has trouble falling asleep, learn why some fairy tales never get old and live out your dreams without leaving your room. Our 2018-19 season will also include classes, story time events and more! Stanley always has trouble falling asleep - even counting sheep doesn't help! 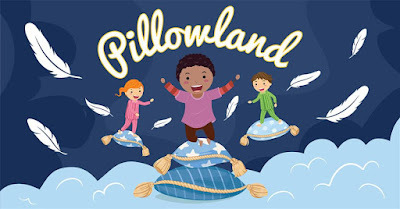 When he receives an invitation to visit the Kingdom of Pillowland, he sets off on an exciting adventure with his friends Finn, Quinn and you! 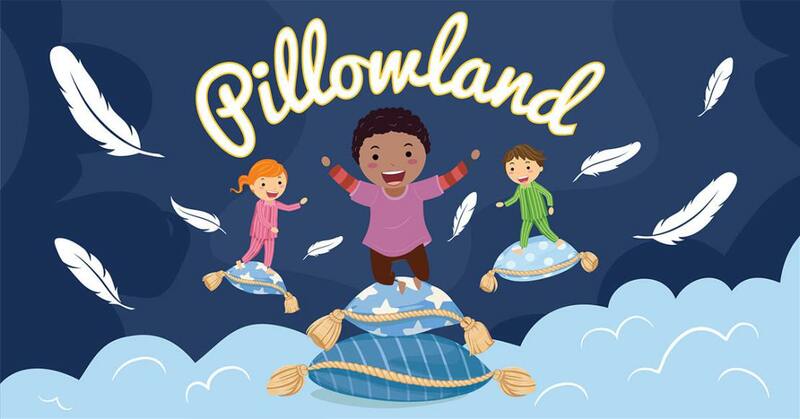 From the company that brought you Please Bring Balloons comes a new interactive play for your youngest theatergoers based on the hit song by Laurie Berkner. Select Sundays through April 14th at 10am and 12pm. A normal day at the park becomes so much more when a young girl gets swept away into four of Hans Christian Andersen’s famous fairy tales: The Princess and the Pea, The Emperor’s New Clothes, The Nightingale and The Ugly Duckling. The company that brought you Interstellar Cinderellainvites you to discover why some fairy tales never get old. Playing at Theatre Row, a program of Building for the Arts NY, Inc.
From the company that brought you Ballerina Swan and the Nutcracker comes a new dance/theater show that celebrates the power of imagination! Join us for pre-show activities in the lobby before every performance and take a picture with the cast after every performance! Save 15% or more by bringing 10 or more people to a show! Visit www.nycchildrenstheater.org/groups or email groups@nycchildrenstheater.org for more information. Children up to 5 years of age and their grown ups will explore children’s books through live music, songs, movement and imaginative play in these 45-minute fun-filled classes! Join us throughout the year for a reading of a children’s book complimented by a craft and/or music class. NYCCT is seeking short plays from some of the most talented playwrights in New York City, New Jersey and Connecticut: Middle School Students! Five (5) grand prize winners will receive a staged reading of their play, performed by professional actors at Theatre Row in May 2019, as well as another weekend of staged readings with Broadway pros in CT sponsored by The New Paradigm Theatre. Every entry will receive feedback from a theater professional. New York City Children’s Theater programs cultivate children’s growth in the areas of emotional intelligence, community building and responsible decision-making. The result is empathetic, creative and independent thinkers who make a positive impact on their world. In 1996, New York City Children’s Theater began as the family theater and education program of the Tony Award-winning Vineyard Theatre. It became an independent 501(c)(3) nonprofit in 2001. For more than 20 years, our local and nationally recognized arts-in-education programs and professional theater productions have served over 300,000 children and adults across all five boroughs and surrounding communities in the tri-state area. 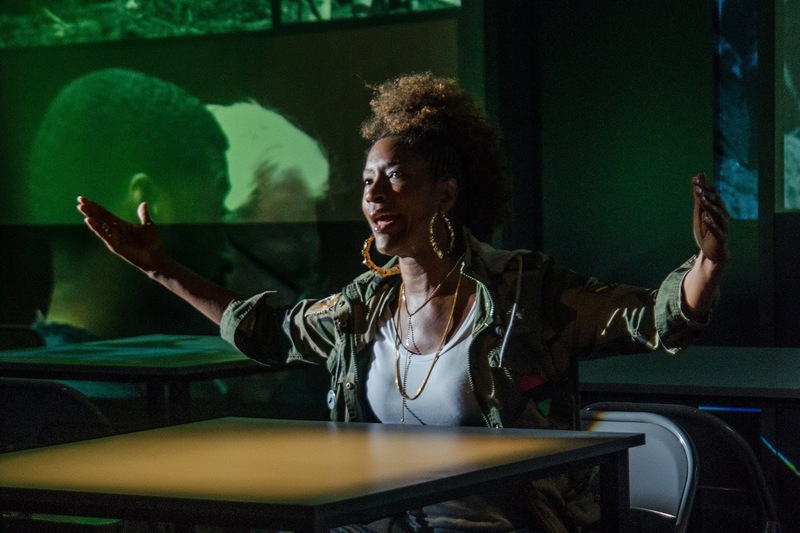 We all get a chance to pull up a seat at a table in the visitor's room of a prison in Liza Jessie Peterson's gripping look at incarceration, The Peculiar Patriot, getting a remount at Dr. Barbara Ann Teer's National Black Theatre. 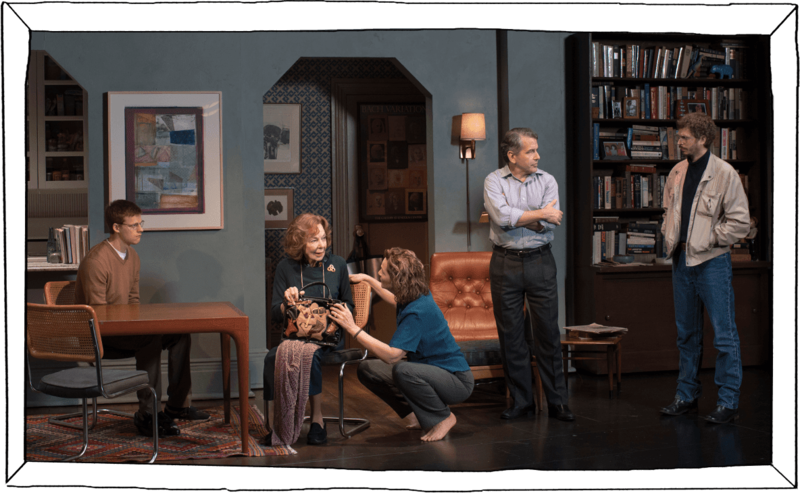 Hi-Arts co-produces the production, which recently received a $100,000 grant from the Agnes Gund’s Art for Justice Fund, Playwright Peterson stars in the passionate one-woman drama directed with precision by Talvin Wilks. Peterson is Betsy LaQuanda Ross (her moniker is the inspiration for the play's title), who regularly visits incarcerated friends and family members. Entering the visiting room (starkly designed and lighted by Maruti Evans), Betsy interacts with guards who frisk her down, greets other visitors their seeing loved ones and then focuses on boosting the morale of her best friend who has about two more years to go on her unjust sentence. Betsy brings news of the woman's three children, happenings in their neighborhood and updates about her own relationship with new beau, the good looking, poetic, political philosopher Pablo. Begrudgingly, she also gives updates about her ex, Curtis, whom her BFF seems to feel is somehow in the picture despite her protests that he is old news. Now, re-read that last paragraph and remember that this is a one-woman play. Peterson is so absorbing in her portrayal, that we could swear we just witnessed a conversation between two characters sitting at the table. All of the people mentioned come to life in our imagination, or by character changes as Peterson, helped by sound effects (Luqman Brown, design) and projections (designed by Katherine Freer) also portrays Pablo and Curtis. The huge problems of mass incarceration, from African Americans being wrongly convicted or getting stiffer sentences than white offenders to the profit-motivated consequences of outsourcing prisons and their services to private companies is covered in the conversations without becoming preachy (the more politically motivated agenda comes in a forced talk-back session that follows every show). The set up might be different, but message is that slavery is alive and well thanks to today's prison system. Like her patriotic namesake, Betsy sews. She recently returned to quilting, an interest she picked up from a woman who was a positive interest in her life. The woman helped her through time in detention and juvenile hall and steered the daughter of a black panther toward pursuing an existence outside of prison walls, Betsy's quilt, which she brings with her on the visits, includes squares for those who are incarcerated. Her best friend's has a full moon to show her potential, a shooting star for each of her three beloved children and a yellow ribbon to show that she will be coming home soon, The lives of those incarcerated become woven together with Betsy's as her needle sews s story of monotony, injustice and despair. Though much of the 90 minutes is intense and deeply moving, Peterson keeps the tale from becoming depressing by including a lot of humor. The story rings true, not only because of the exceptional writing, acting and directing, but because Peterson brings real-life experience to the tale. She worked for nearly two decades at Riker's Island in various capacities. Peterson also was in Ava DuVernay’s documentary "13th" and was a consultant on the Bill Moyers’ PBS documentary "RIKERS." The production at the National Black Theatre, 2031 Fifth Avenue between 125th and 126th streets in Harlem, runs through July 29 prior to a tour planned this fall. Performances are Monday, Tuesday, Thursday and Saturday at 7:30 pm; Saturday at 2 pm; Sunday at 4 pm. Tickets are $35: nationalblacktheatre.org. Composer David Friedman is part of the Desperate Measures team making people laugh at Shakespeare over at New World Stages. 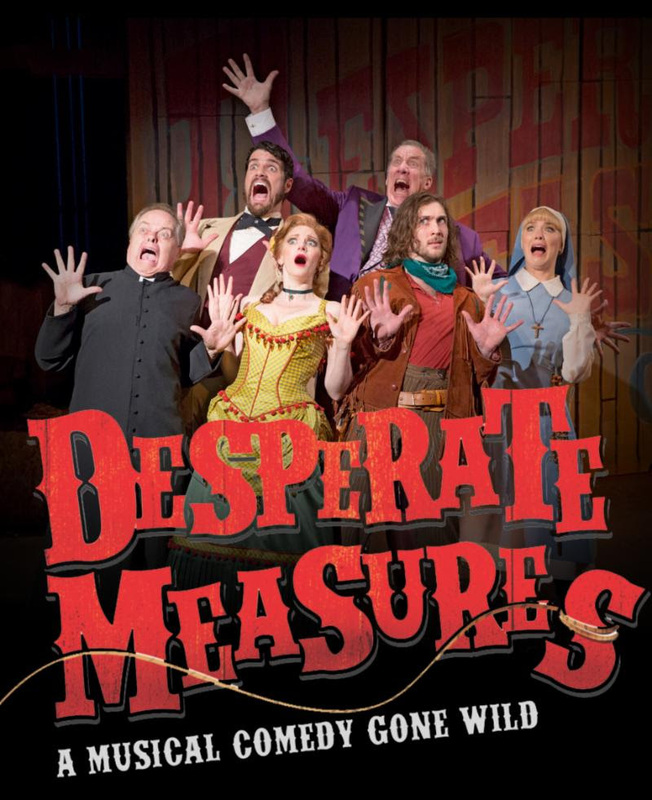 Winner of the Outer Critics Circle Awards for Outstanding Off-Broadway Musical and the Drama desk Awards for Outstanding Music (Friedman) and Lyrics (Peter Kellogg), the wild western take on Shakespeare's Measure for Measure is a silly fun in the midst of desperate times. Friedman continues his positive message in a book called "We Can Be Kind: Healing Our World One Kindness at a Time" (Mango, 2017). 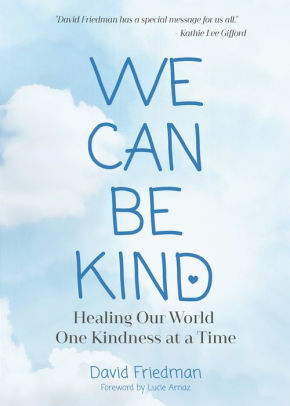 Chapter titles like "So Many Hurts that Happen every Day," "How Do We Make it Better," "The Power to Heal is Right Here in Our Hand" come are taken from Friedman's song "We Can Be Kind." Pain is certainly a big part of our lives, whether we choose to notice it or not. The next time an event occurs which you automatically think of as bad, stop and say to yourself, " do not know what this is for." See if you can hold the idea that good can come out of it in ways you can't imagine." The next time you find yourself in a situation that appears to be hopeless, where there seems to be no solution, try to become aware that you are not alone. The combination of positive philosophy and lyrical verse is soothing and uplifitng. It's just the kind of thing many people are desperate for in times where many events can appear overwhelming. For a fun, feel-good experience at the theater, see Desperate Measures at New World Stages. Desperate Measures, with music by Friedman (Listen To My Heart), book and lyrics by Kellogg (Anna Karenina), and direction by Bill Castellino, is a hilarious new musical inspired by Shakespeare's Measure for Measure. Set in the 1890s Wild West, it is the tale of Johnny Blood (Conor Ryan), a handsome young man whose life is in danger over a saloon brawl. Johnny must put his fate into the hands of a colorful cast of characters including a wily sheriff (Peter Saide), an eccentric priest (Gary Marachek), a authoritarian governor (Nick Wyman ), a saloon girl gone good (Lauren Molina), and a nun out of the habit (Sarah Parnicky) as they all struggle to decide Johnny's fate. Laws are broken and hearts are won as they try to find justice in a world that often doesn' seem just. Sound familiar? Desperate Measures plays New World Stages, 340 West 50th St., NYC.. Performances are Monday at 7 pm; Wednesday at 7 pm; Thursday at 2 and 7 pm; Friday at 8 pm; Saturday at 2 and 8 pm; Sunday at 3 pm.Tickets are $59- $89. www.DesperateMeasuresMusical.com. The soundtrack has just been released. You can find it here. World Stage Theater located on the fifth floor of Museum of the Bible. 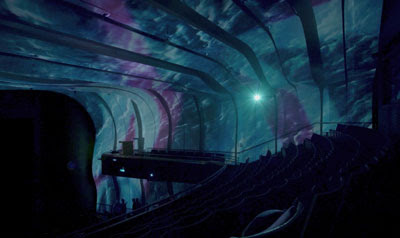 Many of you ask about tourist destinations to visit while you are taking in theater. For those of you seeing theater in the Washington, DC area, one stop to consider is the new Bible Museum. The facility itself, which opened almost a year ago, is quite impressive with a well-thought-out building. The operations of the world's largest museum dedicated to the bible were still getting their feet wet when I visited shortly after it opened. (I'd love to hear from any readers who had more recent experiences at the museum). Spearheading the effort to bring the bible to the midst of tourist-drenched DC is Co-founder and Chairman of the Board Steve Green, owner of the Hobby Lobby store chain. Indeed, many of the museum's exhibits come from his private collection of artifacts collected over many years. Approximately 1150 items from the museum’s permanent collection are on display with another 2,000 items on loan from other institutions and collections. The Museum Collections include artifacts and objects from a range of cultures and time periods, from the Ancient Near East to the modern period. The permanent collection focuses on biblical items, manuscripts, printed Bibles and books, and art. These collections allow the Museum of the Bible to convey the global impact and compelling history of the Bible in a unique and powerful way. Controversy over the provenance of some of the items in Green's collection has resulted in an extended vetting process before items are put on display according to museum officials. An artifact's provenance is the history of its ownership and location, from its creation or place of modern discovery to the present. This history helps to verify the authenticity and importance of an artifact. It also contributes to understanding how an object was used over time. "Two areas are of special concern for museums in general and for Museum of the Bible (MOTB) in particular: first, items that may have been subject to Nazi-era looting in Europe from 1933–1945, and second, ancient objects that may have originated in source nations or in areas of modern conflict, such as modern-day Afghanistan, Iraq, and Syria. Museum of the Bible, in consultation with cultural heritage and legal experts, has developed procedures for researching and investigating objects with potentially difficult histories in areas of turmoil. In doing so, Museum of the Bible has made a firm commitment to ethical collecting and to acknowledging objects in its collection that may have entered the market as a result of war, looting, or colonial practice." Museum of the Bible’s acquisition policy, adopted in 2016, can be viewed here. The museum also offers a number of special events in its 472-seat, state-of-the-artWorld Stage Theater, which is, I admit, what drew me to visit the museum. The national Broadway tour of Amazing Grace premiered with a run there and was followed by concerts by a Christian singing group. In addition, some exhibits included costumed characters explaining life style and history. There are some film presentations available in seated areas and visitors can enjoy a break at the cafe or gift shop. The top floor offers some space for groups to hold events. It has been a while since my visit, so I am hoping things have smoothed out as the museum has gotten up and running. For me, the exhibits in the eight-story, 430,000-square-foot museum seemed limited and rather unimpressive. As more items are cleared for the collection and it grows, I am sure the permanent collections will seem more impressive. I thoughts special exhibits, all of rather short duration, should have been included in the admission price, including "Washington Revelations," a disappointing special interactive ride that allowed participants to feel they were flying around DC to see biblical quotes on buildings throughout the city. The concert I saw was attended by six or seven people. Here's hoping the space will get some use -- and bring in some audience members. Communications overall have been difficult with folks reporting they are unable to find information, both via email or phone. This may improve with increased, experienced staffing. See below for ticketing information and hours and other information including how to support the museum, which does not receive government funding, Its support comes from private donations, memberships and admissions. I don't want to sound negative too here, but I know my readers want honesty. and I do feel there were kinks to work out. 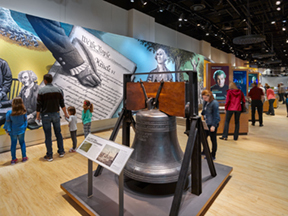 There is great benefit in taking in the exhibits and to a bible presence in the middle of our nation's capital, however, so do check it out if you are in the area. Visit The Bible Museum, 400 4th St SW, Washington, DC, at www.museumofthebible.org. * Closed Thanksgiving Day, Christmas Day, and New Year's Day. Ensemble Award: To Nabiyah Be, MaameYaa Boafo, Paige Gilbert, Zainab Jah, Níkẹ Uche Kadri, Abena Mensah-Bonsu, Mirirai Sithole, and Myra Lucretia Taylor of School Girls; Or, the African Mean Girls Play, whose characters learn the facts of life but whose portrayers taught us all a thing or two about the way things are.